The journey of the past two weeks has been wonderful. It would be foolish not to recapitulate and commend the efforts, during this period. 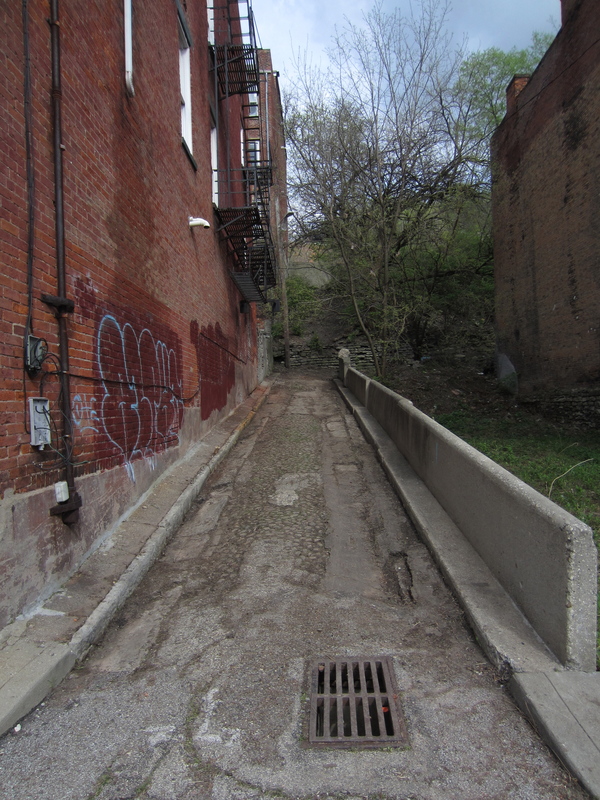 We currently have two main sites: St. Joe Street/Wendell Alley and Peete Alley/Peete Street Steps/Rice Street Steps. Both were carefully selected, based on their neighborhood contexts. We believe that their remediation will assist to rejuvenate interest in those respective areas. It is all about community connections. By that, I mean two things. Certainly, we want to reconnect topographically isolated sections of neighborhoods. But we also aim to connect with community folks who share in our vision. I will divulge those experiences and interactions here. Our second outing to St. Joe Street in Mt. Auburn had high expectations for volunteerism, but we weren’t quite ready to match that expectation with fliers, outreach, and other ways of reaching out. Nonetheless, we made the best of it and pushed onward. Ian Monk and I spent the day progressing nearer to Wendell Alley from Loth Street. The primary objective was to clear the curb line of weeds. Doing so, we feel, gave a clean look to the site–albeit, backbreaking. After discovering the history of the 2200 Loth Street lot–which we will divulge in an upcoming post–we became interested in clearing the edge of the left retaining wall of stones and bricks. I think the results speak for themselves. We absolutely need more volunteers for the St. Joe Street site. Our ambitions reach as far as the North Wendell Alley Steps and beyond, eventually seeking a work order from Public Services for a new hand railing. 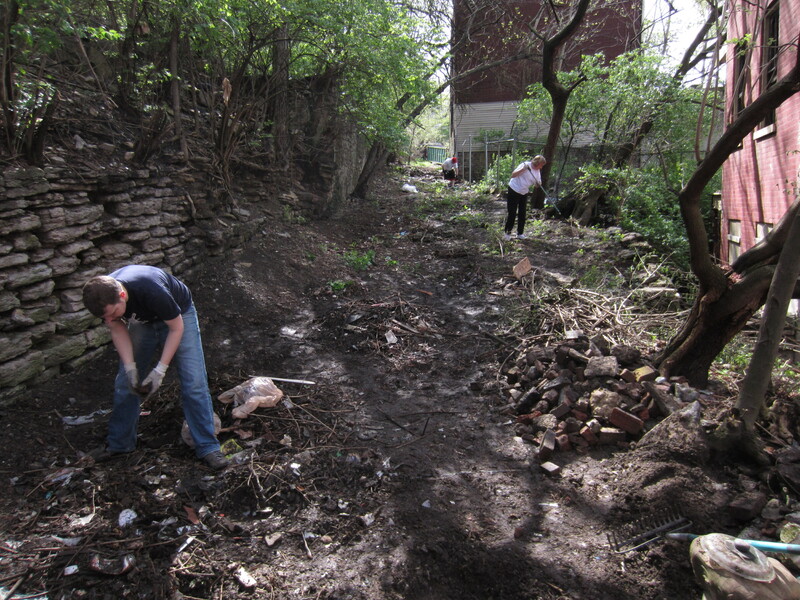 We also would like to clear out South Wendell Alley, at some point, but this is a low priority for now. Just making it to the alley, with a few more volunteer hands, would help us immensely. Several individuals have expressed directed interest at performing work on hillside steps, which we would love to have join our efforts. We recognize that this site is not as high profile as the Peete Alley site, but the value a cleaner, safer St. Joe site would bring to the Jerusalem area of Mt. Auburn could be immense. Part of the SiOS volunteer team in action! Here, facing Vine Street on Peete Alley. Part of the SiOS crew cleaning up the back portion of Peete Alley. Much work to be done! 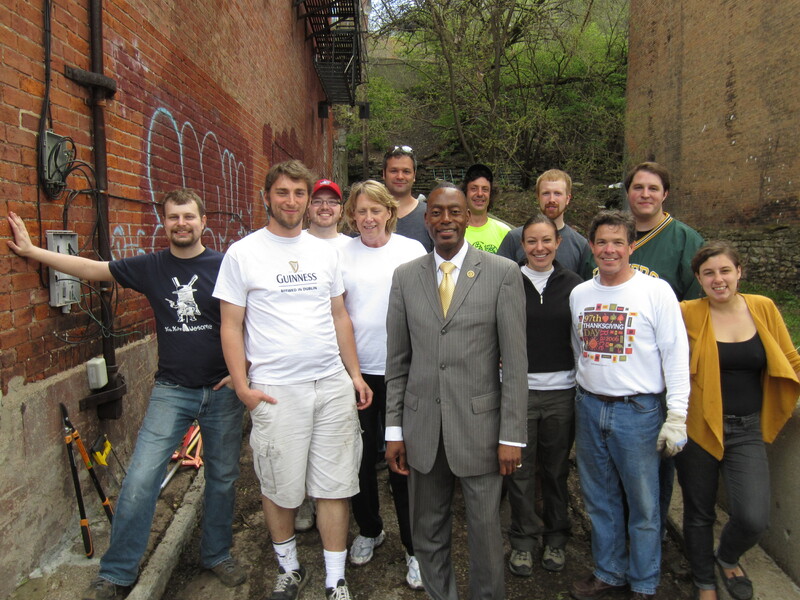 At lunchtime, Mayor Mark Mallory stopped by to pose with the SiOS crew at Peete Alley. 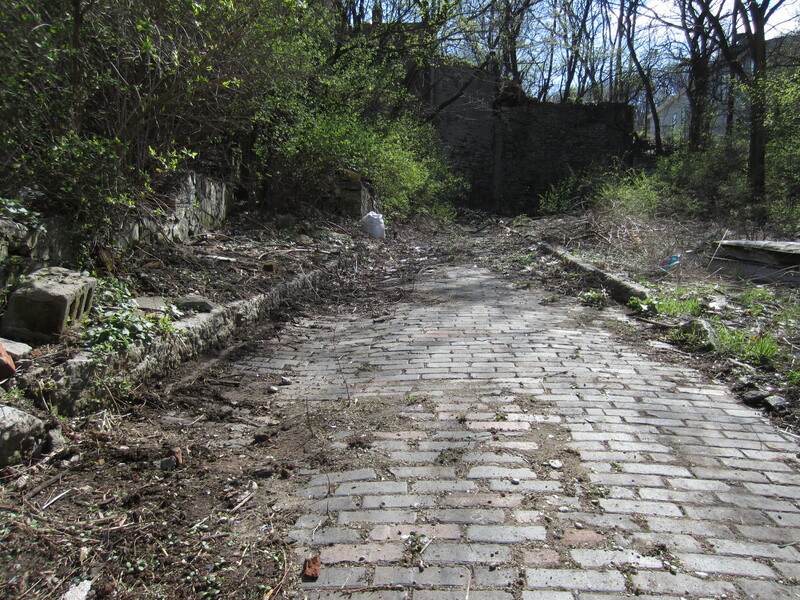 From 9am to 5pm, Peete Alley was transformed up to the rear curve. Work is not done but it's looking great! 5pm: The back portion of Peete Alley is devoid of overgrowth. 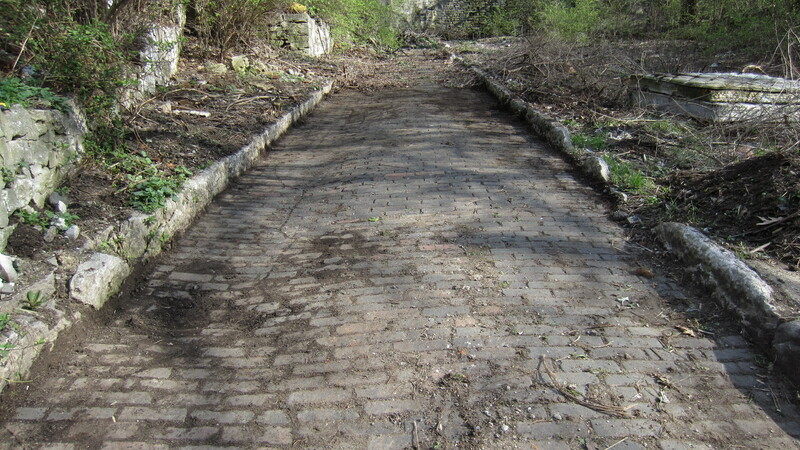 Next step: uncovering those cobblestones! Oh, and the volunteers! 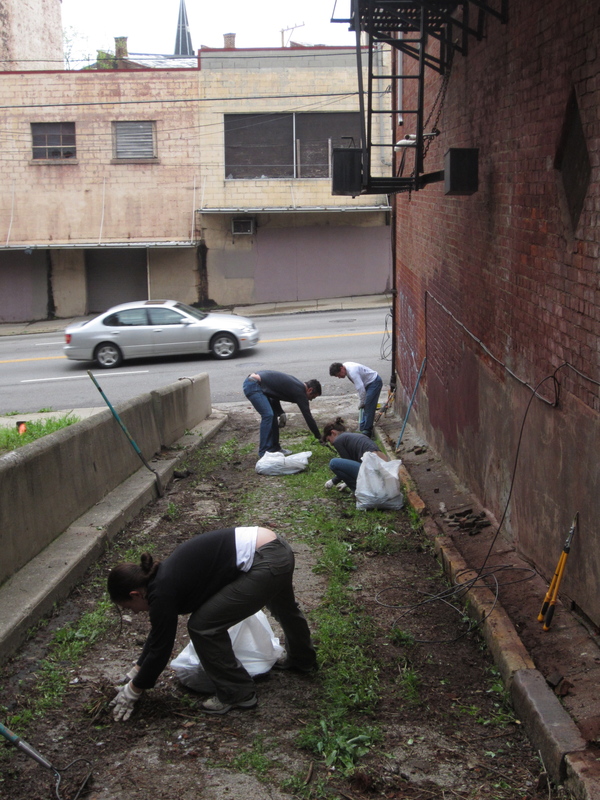 We had a total of fifteen volunteers come out Peete Alley to sweat, dig, and laugh. 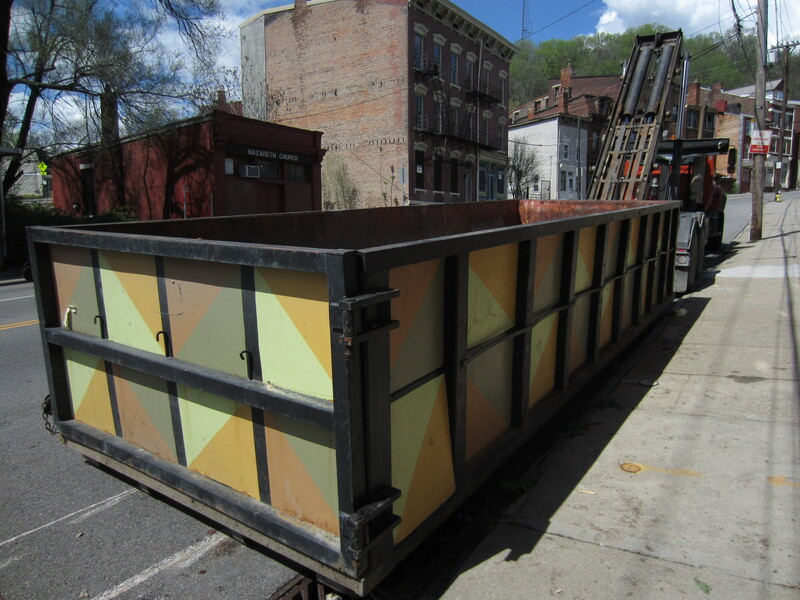 Keep Cincinnati Beautiful supplied us with two SuperCans, essentially large dumpsters into which we could dump large amounts of overgrowth and litter. A man I met outside the Clerk of Courts office, the previous day, came with his daughter and brought a wheelbarrow, living just a short walk away on McMicken Avenue . The hours we had it at our disposal were much easier than the hours we did not, so we will be looking to obtain one for future cleanups. Another man stopped by the site, by the name of Jeff. He is a man who lives on Loth Street, down the way from our St. Joe Street site. His brief visit gave us great insight about the neighborhood, it’s dealings with dumping and suspicious activity. It is these encounters from area residents that make our initiative so much more fruitful. Achievement: two half-filled SuperCans with litter, soil, and overgrowth. One bag of recyclables. Focusing on both existing cleanup sites: We would like to concentrate efforts, over the next few weeks, on both cleanup sites. Spring in Our Steps will include many other sites the future, but would like to first reach a safe, desirable state for both. 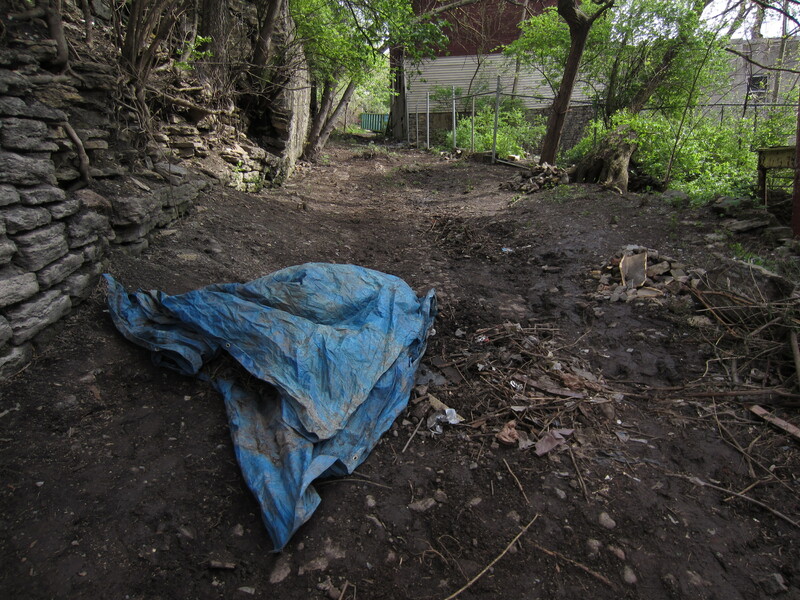 If you have suggestions for future cleanup sites, please drop us at a line at springinoursteps [at] gmail dot com. Stepping Up in April!–daily staircase cleanups: Additionally, we will be planning daily cleanups of city staircases for the entire month of April. Details are forthcoming but a weekly schedule will be available on our blog and facebook page. Photo recaps can always be found here. The purpose is to highlight more little-known pedestrian spaces in Cincinnati, inviting anyone at their convenience to join us. They are meant to serve as one-hour to ninety-minute cleanups at your will. Hillside steps often do not warrant the attention that alleys and paper streets require, due to the inherent litter problem that alleys have. So, if you’re up for light litter cleanup and trimming overgrowth, be our guests! Speak up about missing handrails and lighting: If you have any requests for handrail replacements or bulb replacements on street lamps, let us know. We are eager to work with Public Services and Duke Energy to ensure heightened safety in our alleys and on our staircases. So when is the next meet-up? Time and place?? The next cleanup will be held at St. Joe Street in Mt. Auburn on Saturday, April 7th. We will be without a SuperCan for this cleanup, but encourage anyone who is not going out of town for the holiday to join us. A facebook invite will go out tomorrow, as well as emails to anyone who prefers that mode instead. Time will most likely be 10am to 3pm, as it appears people are more atune to an earlier start time. This entry was posted on April 1, 2012 by C. Huelsman in Alleys, City Steps and tagged alley, hillside steps, Jerusalem, Loth Street, mt. 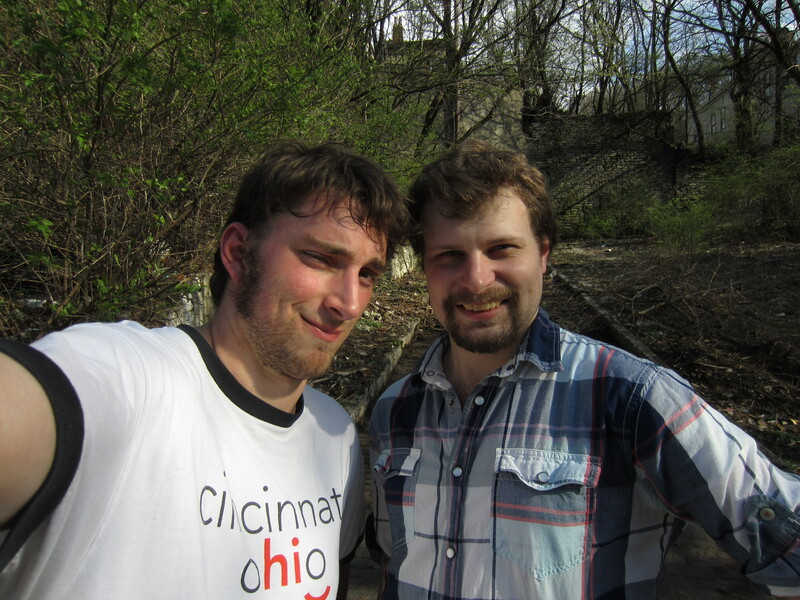 auburn, OTR, Peete Alley, Stepping Up in April!, Vine Street, Wendell Alley.